In recent decades, the appearance of the Marches vineyards has changed profoundly. Vines grown on trees or pergolas around the house or in the garden have disappeared from the landscape, making way for more rational training systems that are always entirely vertical in form and with a double arch. 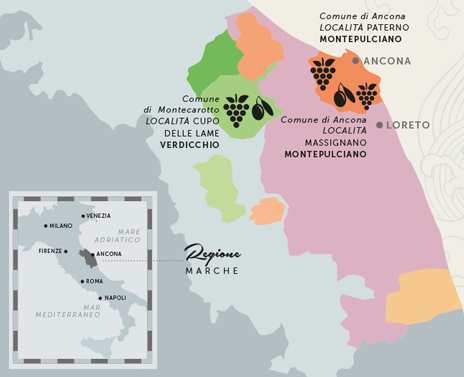 The Marches now produces an annual average of two to three million hectoliters (54,6 to 78,95 million gallons) of wine, with whites accounting for 60 percent to 70 percent of output. The production covered by the D.O.C. system is substantial, with averages that surpass national rankings. The steady evolution of the quality of Marches wines ongoing for years is clearly perceptible. And it has been accompanied, in most cases, by wise and honest price policy. The quality of the wines now available is an indicator of the maturity the sector has reached in recent years in the region and it bears the message of a winemaking area that has moved on from adolescence and, aware of the good results obtained, is now viewing prospects that are even more far-reaching. The longevity record Marches inhabitants have set in recent years is an obvious sign of the region’s high quality-of-life. That record, together with the fact that the region leads nationwide in per capita wine consumption, offers a sensible response to those who are waging an irresponsible and indiscriminate campaign against wine drinking. In recent decades, the appearance of the Marches vineyards has changed profoundly. Vines grown on trees or pergolas around the house or in the garden have disappeared from the landscape, making way for more rational training systems that are always entirely vertical in form and with a double arch. Recanati Recanati is a small town extending along the top of a ridge at an altitude of 296 meters (971 feet) between the valleys of the rivers Potenza and Musone. The Adriatic is nearby and the town occupies a sort of natural balcony facing the sea. There are panoramic views of the Apennines and the sceneey is among the most picturesque of any area in the Marches. Despite a legend connecting the community with a Roman colony, it seems that the town was actually founded at the end of the 12th century. It still preserves a sturdy circuit of walls pierced by narrow openings giving access to the center of town where the Palazzo Comunale and Church of San Domenico are situated. The birthplace of numerous illustrious personalities, including the poet Giacomo Leopardi and opera tenor Beniamino Gigli, the town contains important monuments, old and elegant palaces, churches, museums and libraries. The exceptionally mild climate, the richness of the artistic heritage and the warm hospitality of its residents make Recanati a pleasant place to visit. Loreto is perched on a hill surrounded by an enchanting landscape with a view extending from the Adriatic to the Apennines. For more than seven centuries, Loreto has steadily attracted large flocks of pilgrims because it contains one of the world’s most famous sanctuaries in which the “Holy House” is preserved. It is the room of the Virgin Mary, whose walls were brought from Nazareth to Loreto in 1294, borne by angels, according to tradition, or transported across the sea by men as a precious reliquary, according to the reasonable hypotheses of historians. The architecture of the great basilica, built around this small sacred structure toward the end of the 15th century, is solemn and attractive, a fitting framework for a place of intense devotion that is also extremely interesting to all those who love the arts. The town grew up around the sanctuary over a long period. The oldest part is enclosed by walls. During the reign of Sixtus V, toward the end of the 16th century, the community expanded beyond the walls and today about 11,000 persons reside in the immediate area. 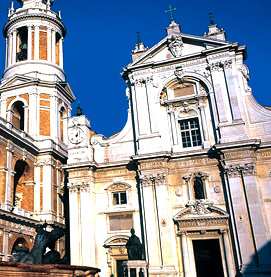 Loreto is truly fascinating from the standpoint of landscape, the arts and culture. It is a town that appeals to tourists for many different reasons. This small town is situated on a hill overlooking the Adriatic at an altitude of 212 meters (695 feet). The site is flanked by the green valleys of the rivers Aspio and Musone. Castelfidardo played a major role in the history of Italy. On September 18, 1860, one of the most significant battles of the Risorgimento - the Italian independence movement - was fought in the vicinity of the town. Today the town is internationally renowned for its manufacture of accordions and other musical instruments, exported throughout the world. Paolo Soprani founded the accordion industry in 1863 when he opened the first artisanal workshop for the production of the popular instrument. Unmittelbar südlich von Ancona ragt der Monte Conero einsam erhaben empor und endet mit seinen Steilhängen am Meer, mit den schönsten Stränden der gesamten nordadriatischen Küste. The isolated peak of Monte Cònero, whose stony slopes descend steeply towards the sea and the most attractive beaches of the northern Adriatic coast, rises abruptly from the sea immediately to the south of Ancona. The shore of the Cònero, the most characteristic stretch of the coastline of the Marches, features numerous inlets with brilliantly white beaches clustered in the shadow of the mountain. Some of those beaches can be reached only by boat or on foot along paths that pass through the greenery of the Cònero Park. The area was designated as a regional park in 1987. In the zone, the villages of Portonovo, Sirolo and Numana are of great interest to tourists. Recanati is a small town extending along the top of a ridge at an altitude of 296 meters (971 feet) between the valleys of the rivers Potenza and Musone. The Adriatic is nearby and the town occupies a sort of natural balcony facing the sea. There are panoramic views of the Apennines and the sceneey is among the most picturesque of any area in the Marches. Pets:Your four-legged friends are welcome, but may not accompany you during the tour in the winery, thus we discourage bringing pets. 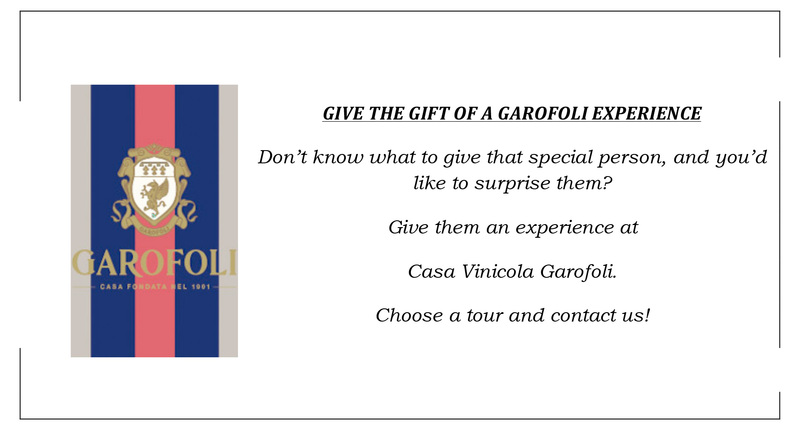 • Tours by reservation only.